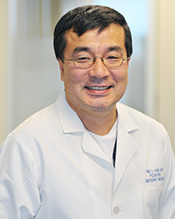 Dr. Yong Han is loved by all – his patients, their families, and his colleagues, especially nurses who work with him. According to one nurse, Han is a true nurse advocate who shows his appreciation for their contributions towards achieving the highest quality of patient care. The nurse also noted Han’s impact on a patient who was having a hard time, saying his compassion and tender loving care helped the patient cope with having a serious illness. Another nurse who works with Han said the physician is truly a nurse-friendly physician who treats nurses as health care partners and that his attitude is much appreciated. In relation to the way Han treats his patients, the nurse said Han is always willing to talk to families regarding their concerns and that he rounds and introduces himself to his patients no matter what time of day or night he comes on duty. Families comment on how much they appreciate his detailed and open communication style and feel he really cares, the nurse said.